Our favorite local Italian luthier, Luca Quacquarella, was recently commissioned with this vintage Gibson ES-175 restoration. This guitar, which dates back to 1964, was the property of one of the local hotels in Singapore and had been languishing in a damp basement storeroom, unplayed and neglected, for a few decades. Someone had even pasted a couple of hotel baggage stickers on the back, just in case the ownership of the guitar would ever be in doubt. The nitrocellulose finish had clouded with the passage of time and the seam on the lower bout of the guitar had split due to water damage. 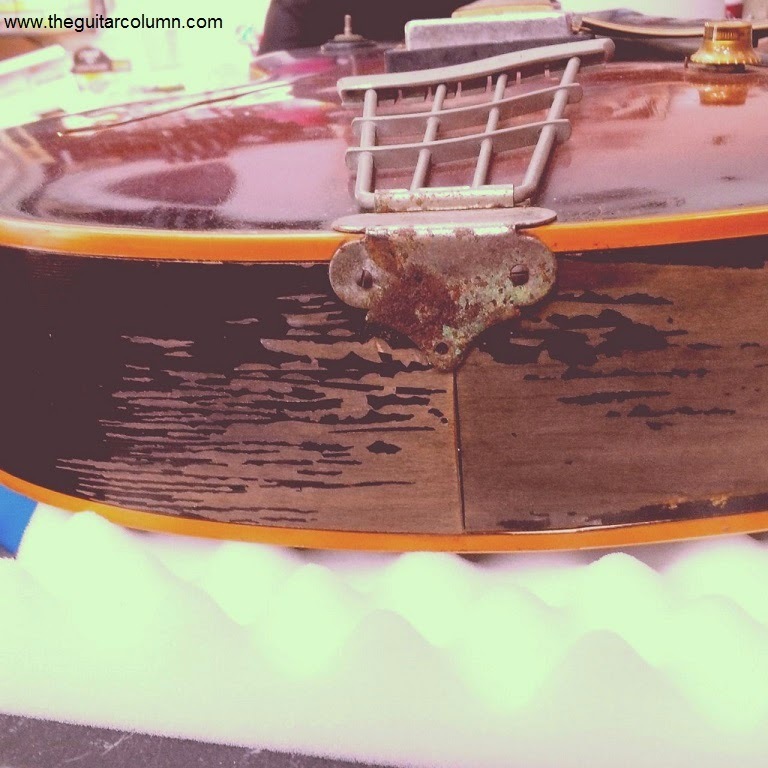 The Hofner tailpiece, that someone had used to replace the original ES-175 'zig-zag' trapeze tailpiece, had also severely corroded. 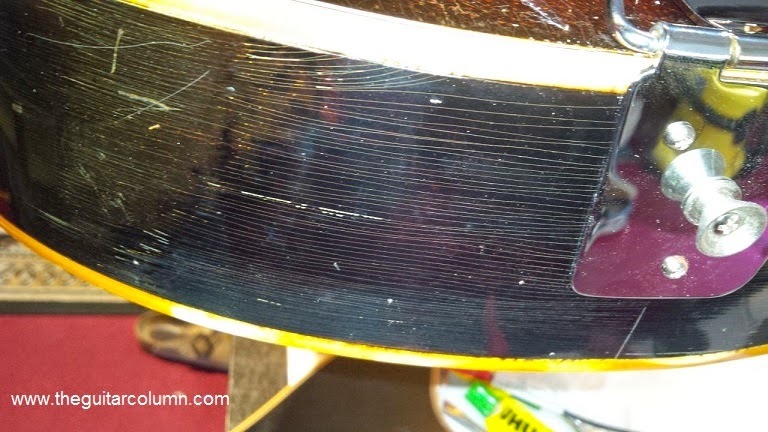 Although how anyone could possibly damage an ES-175 tailpiece to the point where it had to be replaced, we'll probably never know. Remember that this was a guitar used by the hotel lobby band and not subject to the rigors of outrageous stage antics or heavy usage. My guess is that someone took a fancy to the original tailpiece and swapped it out for the Hofner tailpiece when no one was looking. Luca's first task was to remove all the hardware and electronics, labelling everything to facilitate their re-installation later. The pickups that came with the guitar had the rectangular black stickers with Patent No. 2737842 on the underside, and very large diameter volume and tone potentiometers, true to the period that this guitar was from. Interestingly, Patent No. 2737842 was not the patent designation for the humbucking pickups but was actually the patent number for Gibson's trapeze tailpiece bridge! As you can see in the pic on the right, the lower seam had completely split and was lifting away slightly. After Luca glued the seams together, he needed to match the deep brown color of the original finish on the sides. Mixing dark brown nitrocellulose lacquer with a smidgen of black, he managed to perfectly match the original finish. Relic'ing and check lines added! To match the checking of the original finish, Luca added artificial check lines to the new, pristine lacquer. A good knowledge and understanding of the grain and directional patterns of how lacquer would naturally check is definitely required here. Although the precise technique that he used to artificially create the checked lacquer lines is something that he does not seem to want to talk about. A trade secret shall remain a trade secret! 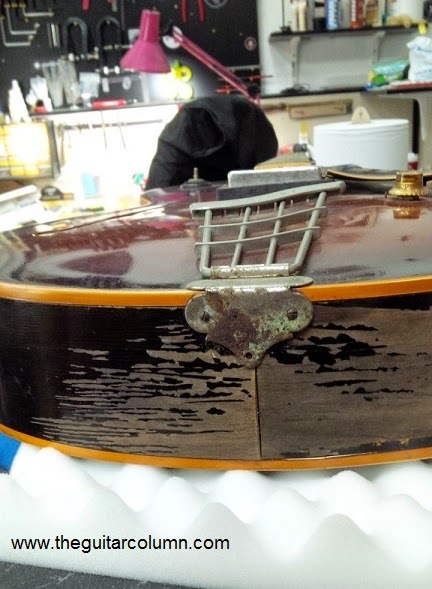 Once the repair had been completed, the entire guitar was gently wet-sanded to bring back some of the original shine of the lacquer on the headstock, back of the neck, and the body of the guitar. But according to Luca, he was careful not to make it too shiny, lest it look too new and fake. 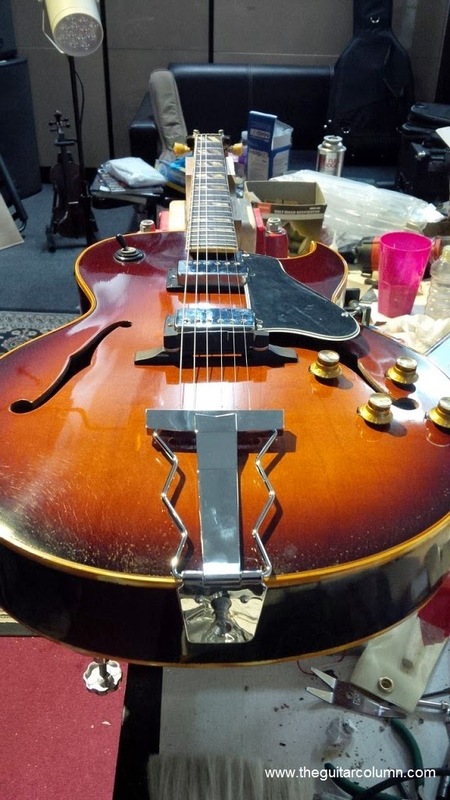 To complete the repair and restoration, an after-market ES-175 tailpiece and pickguard were special-ordered to replace the Hofner tailpiece and the original celluloid pickguard. 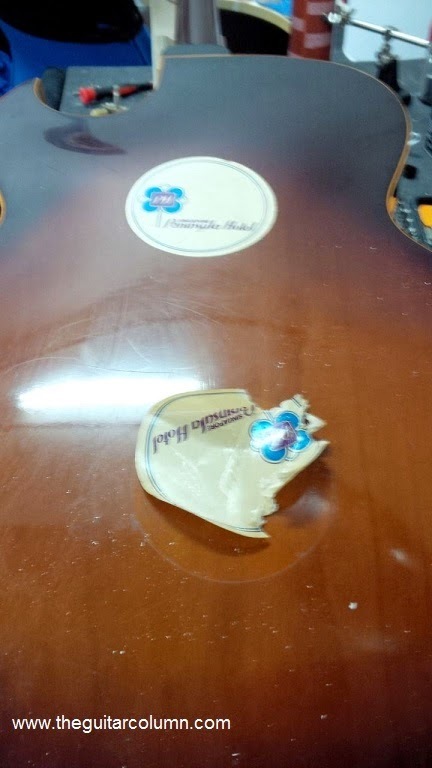 Celluloid starts to de-gas after a few decades and this pickguard was already warped and starting to disintegrate. CrazyParts.de in Germany, by the way, makes an excellent after-market ES-175 zig-zag tailpiece! 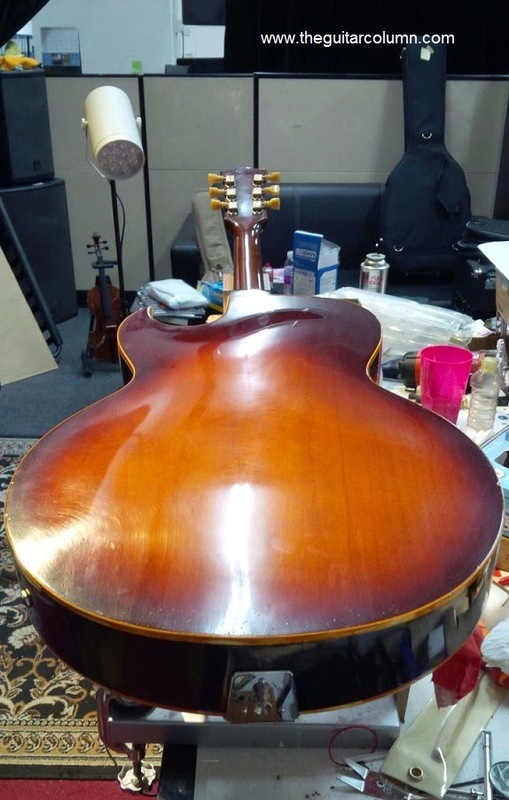 Looks like this 1964 Gibson ES-175 is ready for another 50 years of music!